Their work is exhibited in museums, they write books about their artistic crafts, and for MEZ they develop unique designs and yarns. The very successful cooperation between the two designers, ARNE & CARLOS, and Schachenmayr is exclusive and unparalleled. Arne Nerjordet and Carlos Zachrison are textile designers. Their knit creations, inspired by traditional Norwegian patterns, have made them stars on the creative scene. 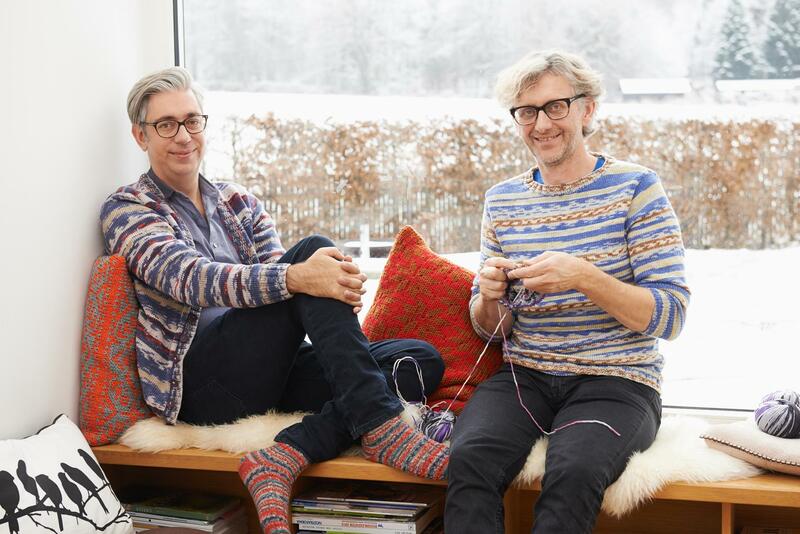 Their ARNE & CARLOS label, founded in 2002, and also their books are so popular that they travel with them, around the world – always knitting, of course. Arne Nerjordet was born in 1964 in a small town in the mountains of Southern Norway and grew up on a farm which was home to four generations. There was no televsion but there was a large, gregarious family with a great-grandfather who was a fantastic story teller and a grandmother who taught Arne to knit while he was still a small boy. Incidentally, in the past, knitting was an occupation for men, such as shepards, for example. At any rate, Arne loved knitting but he didn't love the predetermined patterns – he preferred to think patterns up himself. The craft which began as something to do after the cows had been milked became a truly artistic profession, following a path which included such stations as training to become a bookbinder, a stay at a crafts’ school, a couple of semesters studying social anthropolgy, and finally studies at the French fashion academy Esmod in Oslo. It was there that he – meanwhile having become a lecturer – met Carlos Zachrison, who had been born in Brazil. With a Swedish father and a Spanish mother, Carlos could speak several languages, which proved to have an advantageous effect on the international career of the pair. But above all, Carlos had the same love of knitting as Arne did. In 2002, the two founded their ARNE & CARLOS fashion label and quickly celebrated successes, especially with their knitwear in which the Scandinavian heritage of the designers was apparent – and which became their trademark. They interpret elements of their history and their culture in their own manner, thereby creating modern, unique designs. History meets personal touch – and the classic Norwegian pullover becomes a fashion statement. It was certainly no accident that the Japanese avantgarde fashion house “Comme des Garçons” became aware of knitwear by the two artists. First it bought their pullovers and then their knit Christmas ornaments and sold these at a high price. That, in turn, gave the creators the idea to publish a book. 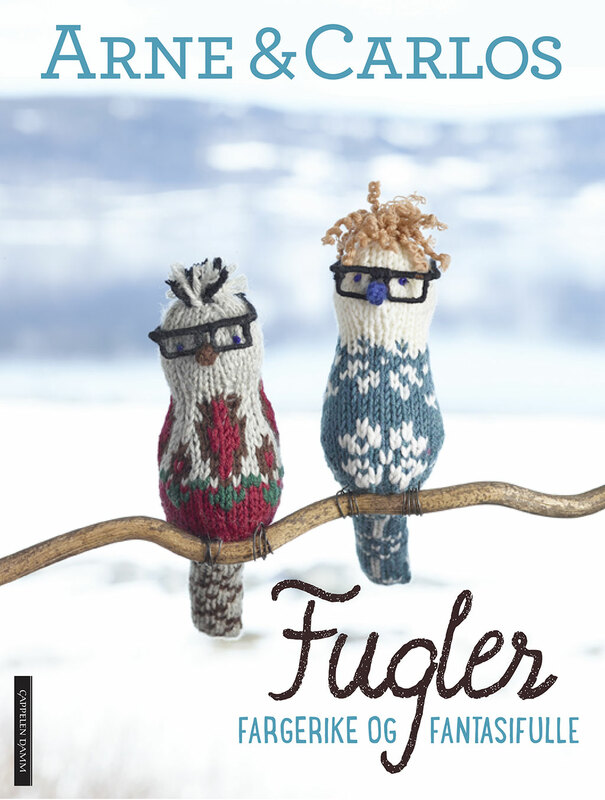 In 2010, “Julekuler” was published. This book, which contained instructions for knitting 55 Christmas ornaments, became a hit and was translated into 15 languages. The same holds true for all the following books, about knit Easter eggs, flowers, dolls, and traditional Norwegian patterns. The cultural importance of their work is documented by permenent exhibits in the “National Museum of Art, Architecture, and Design” and in the “Norwegian Museum of Cultural History”, both in Oslo. The “Louisiana Museum of Modern Art” in Denmark and the “Gwangju Museum of Modern Art” in South Korea also exhibited their works. For ARNE & CARLOS, the central place of their work and also of their life, lies in Etnedal, in Southern Norway. There they turned an old train station into their personal refuge, just as unconventionally as they create their art. It is the ideal retreat for the designers, who, after resigning from the fashion label and no longer wanting to travel around the world, can now do exactly what they always wanted to do – study traditional Scandinavian patterns and revitalize them. Among other things, the result can be seen in their cooperation with MEZ, which returns them to their roots as designers of knit fashions. For the Schachenmayr brand, they develop new yarn editions and create powerful color gradients and gorgeous designs. This work shows an impressive combination of colors and patterns, a successful symbiosis of traditional and modern.